The community has donated some housewares for units, but more are needed. To make a donation, drop items off at Catholic Charities Family Services Center, 12 E. Fifth Ave., Spokane, or call (509) 459-6187 for more information. Now that Ervine Osman has a home, he’s looking forward to doing the little things most people take for granted. Osman, 34, and his dog, Bella, have been homeless since last December. They were among the first few residents to move into Catholic Charities’ newly completed Father Bach Haven apartment building, which will get chronically homeless individuals off the street and into a place of their own. Catholic Charities partnered with Garco Construction on the $6.8 million project, which was funded by an award from the state Housing Finance Commission. Catholic Charities officials are seeking a project-based Section 8 contract. The four-story building features 51 units, including studios and one-bedroom floor plans ranging from 358 to 758 square feet. The rooms, which are wheelchair-accessible, have stained concrete floors for easy maintenance and built-in furniture, including either a twin or full bed. “We wanted them to be as low-maintenance as possible because we knew operating costs would be an issue,” said Monique Kolonko, associate director for seniors and housing. There’s a computer lab in the building and a garden out back where tenants can test out their green thumbs. There’s a full-time social service coordinator there who will help connect residents with vital services. Heylman Martin Architects designed the building, which is located in downtown Spokane. To live there, applicants must meet the Housing and Urban Development definition of chronically homeless and make less than $13,000 a year. As of Thursday, four applicants had been approved for permanent housing, but many more applications were being processed, with more submitted each day. Residents must sign an agreement that they won’t engage in any illegal activity. Thirty percent of each tenant’s income goes to paying rent. Paul Lewis, the first tenant to move in Thursday, has gone from couch to couch during the past five or six years. Lewis, 27, was 4 years old when he was hit by a car while riding his bike, he said, pointing to a long scar that begins at the top of his head and wraps around down the left side of his skull. He spent 27 days in a hospital and underwent physical therapy for a year. He has since suffered ailments he says make it hard to hold down a job. He has suffered migraines and constant pain since then and began having seizures last January. 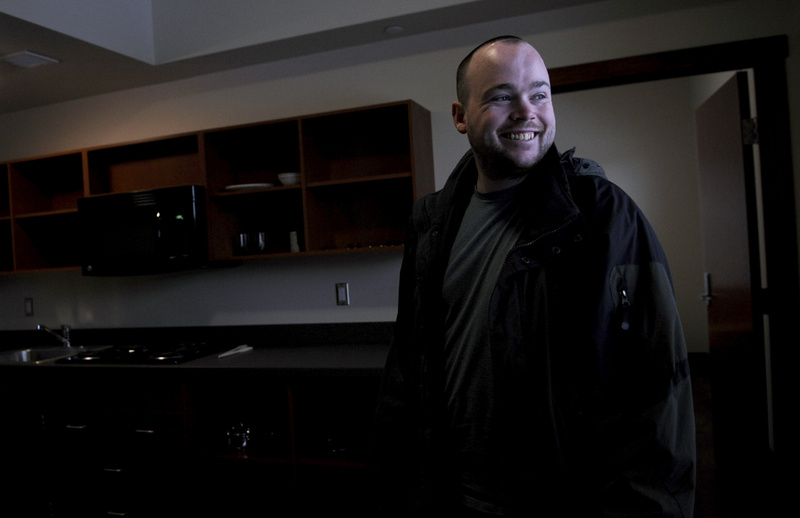 Lewis, who receives unemployment benefits, is seeking disability but has been denied twice. Despite his difficulties, his new home offers him hope. Officials estimate the building will be filled by the end of February. The building’s completion comes at a time when city officials and the community grapple with how to handle homelessness, including a Spokane couple’s proposal to put a tent city downtown. There are an estimated 1,185 homeless people in Spokane, according to a January census by the city’s Human Services Department. About 130 live on the streets. The eponymous Monsignor Frank Bach was a former director of Catholic Charities and now sits on the housing board. Osman, who receives disability benefits, completed an 11-year prison sentence for grand theft, assault and attempt to elude in 2009. He came to Father Bach Haven on Thursday with little more than a backpack and some clothes after spending the past year living in a tent.